Rinko Kikuchi stars in the odd, yet irresistible Kumiko, the Treasure Hunter. Directed by David Zellner. With Rinko Kikuchi and Zellner. Now playing. Imagine a filmmaker pitching this story to a prospective distributor: A delusional, emotionally disturbed, young Japanese woman finds a discarded VHS tape of the Coen brothers' Fargo. Convinced that the scene in which the Steve Buscemi character buries a briefcase full of $100 bills in the snow actually happened in real life, she steals a credit card and travels by herself to rural Minnesota in the dead of winter. There, penniless and with very limited English, she ends up wandering half-frozen through the snowy countryside, wrapped in a stolen motel bedspread, with wild dogs nipping at her heels. That's a nutshell synopsis of David Zellner's Kumiko, the Treasure Hunter. It would take a foolhardy businessperson to imagine even the quirkiest film festival or art-house audience wanting to see such a grim, pathetic story. 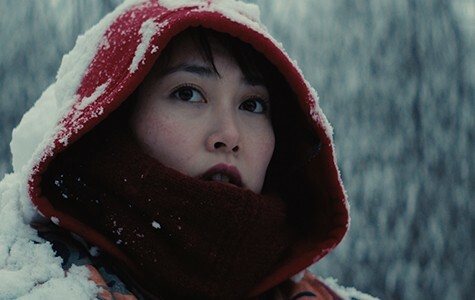 And yet Zellner's fractured fairy tale, with actress Rinko Kikuchi in the title role, manages to view Kumiko's predicament from a defiantly good-natured perspective, transforming her sad tale — based on a real 2001 incident that inspired a documentary — into something resembling a brave fable of the unconquerable human spirit. Or an ironic narrative treatise on the power of wishful thinking — take your pick. Kikuchi (Babel, Pacific Rim) plays Kumiko absolutely deadpan as an unambiguous tragic figure. Picked on by a sexist boss and her snotty admin-assist coworkers in a Tokyo office, she lives alone with her only friend, a pet rabbit named Bunjo, existing on instant noodles and shrinking from everyone who offers her a friendly word, especially her nagging mother on the other end of the phone line. But it's only in her collision with "Minnesota nice" that we can see just how deeply buried Kumiko really is. In someone else's movie, Kumiko might have fallen prey to two-legged predators in the strange new land, but she exists in a sort of North Country state of grace. A deputy sheriff (played by the director, who wrote the screenplay with his brother, Nathan Zellner) takes pity on her and offers a clumsy helping hand — he takes her to a Chinese restaurant in hopes of getting the Mandarin-speaking owner to translate Japanese. If their scenes together have a wry, familiar Midwestern flavor, that may be due to the participation of Alexander Payne (Nebraska, Sideways) as executive producer. The natives' compassion for the quixotic traveler only goes so far. Aside from the shy deputy and a lonely widow, the people Kumiko encounters seem content to let her go on her misguided way as long as her money holds out. As she trudges relentlessly to her doom, we can literally feel her slipping from our grasp. Filmmaker Zellner, an actor-director who has gravitated to portraits of marginal characters, might well have been inspired by the work of Robert Bresson. Kumiko's hard-headed determination to be a holy fool is reminiscent of Bresson's outcast peasant girl Mouchette, as well as the saintly mistreated donkey at the center of Au Hasard Balthazar. Like them, she suffers for our edification. The flavor is odd and completely irresistible.